A few days ago, in front of an audience of over three thousand people, the leader of the Imperium—the largest coalition in EVE Online and perhaps the largest player alliance in any video game—announced that it would go to war. Over the next 24 hours, Imperium pilots deployed over 1200 capital class vessels to the far end of the universe, and set about staging the next great conflict in EVE’s history. TheMittani’s speech evoked a call to arms for his coalition to exact revenge for perceived wrongs they suffered during EVE’s last great war, roughly one year ago. There’s never a peaceful day in the universe of EVE. The game is driven by player conflict. But a declaration of war is something out of the ordinary. More often than not, when people talk about EVE war, they are specifically talking about the conflicts between the massive groups who control swathes of space in the Null Security regions of space. These wars are generally fought over player-controlled resources, and are massive conflicts that span weeks and months with tactical objectives, instead of flash-in-the pan fights between random players who meet in space and senselessly destroy each other. When one of these wars begins in earnest, every player in the game can end up ensnared in its web, somehow. Players inside the warring groups are on constant standby, waiting for their alliance’s broadcasts to sign into the game and pilot their ship into the breach. Massive fleet fights also attract individual players, or smaller uninvolved groups. These players stalk the warzones, looking for people to fight or, more often than not, targets of opportunity separated from their parent fleets. These pirates seek to profit from the war zone without being directly involved in the overall theatre. The home territories of the warring alliances also become havens for pirates and ne’er-do-wells. With the majority of the fighting forces deployed to the front lines, players who seek to only play EVE in a PvE context—be that shooting NPC pirate ships for credits or mining minerals to supply the starship foundries—find themselves in constant danger. Players searching for easy kills or dank frags move en masse to the farming grounds of the warring factions, destroying everything they can find, before fleeing from the greatly reduced response fleets. Some factions even send guerilla warfare specialists into their enemy’s backyards to wreak havoc in the homelands and slowly drain away at the morale of their foe. Even for those who choose to spend their time in the safer places in the universe, the high-security regions of space are not completely separated from the war. War does not keep itself cleanly inside the confines of the battlefield. In EVE, every single ship, gun and missile is created by players, from resources harvested by players inside of the game. So, when thousands of players come together in massive battles, ships are destroyed on a scale that doesn’t exist anywhere else in the game. The entire game’s economy shifts: ships can double in price literally overnight, allowing for savvy players to make massive profits if they invest wisely. Some ships are made of rare materials that take time to source, and very specialized skills to work with, so war can cause a massive drop in overall availability of these ships. In the past, alliances have burned through so many of a specific hull in one of their war doctrines that the vessel will go temporarily extinct inside of the game universe, with none available for sale in any market in the game. In an unsurprising parallel to the real world, war does not keep itself cleanly inside the confines of the battlefield. Even in EVE, wars can be decided by the overall morale of an alliance’s populace. If a side finds itself constantly losing, never making positive ground or being made the laughing stock of the game, things will start to deteriorate. Players belonging to that alliance will slowly stop logging into the game. Fleet form-ups will be smaller and they will find themselves unable to contest objectives like they could during the beginning of the conflict. War in EVE is fun, but eventually, the fun dries up unless you can be convinced that you are on the winning side. The flame wars on Reddit can get more heated than any in-game battle. These effects can be magnified by psychological warfare and propaganda, a form of warfare all its own. This war of disinformation and misdirection is conducted mainly on the EVE Online subreddit. Every major battle is spoken about at length on Reddit for hours after it is over, with players arguing over which side won the battle and which side should quit the game forever and move on with their lives. The flame wars on Reddit can get more heated than any in-game battle, as hateful rhetoric gets tossed about as liberally as laser blasts from space ships. In-game rivalries are often intensified by the drama on Reddit, and more often than not the court of public opinion can influence who is perceived as the winner or loser of these massive conflicts. Wartime is an exciting time in EVE, a time where heroes are made and legends are forged. During nearly every massive coalition-sized war, EVE has made waves throughout the gaming community. The battle of B-R5RB during the conflict known as “The Halloween War” caused destruction on a level never before heard of in a digital theatre, collectively destroying over $300,000 worth of internet spaceships. It even has its own Wikipedia article. 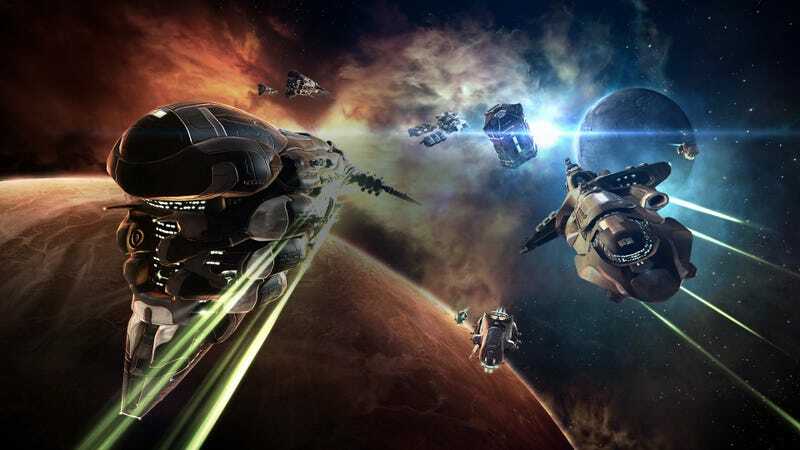 These huge battles, serving as capstones to the wars, often attract new players to EVE Online who seek to engage in the kinds of battles that they’ve just read about. In addition to attracting new blood, player engagement for current users spikes, as they are called to defend their space, or to assault their foes. So, if war is so great, why is there ever peace? Why is the galaxy not constantly on fire? Well, even in video games, war can be hell. EVE Online was likely never designed to have over two thousand players in the same place shooting at each other. The amount of server lag caused by the engagements can be debilitating, and in the early days of EVE online ships would stop responding for minutes at a time, with people not even able to determine if the commands they were giving were going through to the server. To solve this, CCP implemented a system called Time Dilation, commonly known as TiDi. In the context of EVE Online, Time Dilation means that the server is slowed down in affected systems. As more and more players pile into a star system, the time between actions begins to increase. At maximum strength, the game is slowed to 10 percent of real time. Commands that should take a seconds to complete end up taking minutes. This allows the CCP servers to ensure that each command is activated in the exact order it was input, across thousands of different players. This solves some problems, but can lead to players being forced into engaging in fights lasting well over four hours. During war time, these fights can happen three or four times during a week. This can cause massive stress on a player’s life, and can lead to a lot of fatigue, and over time, quite a bit of burnout. The current war in EVE is just getting underway, and the forces of the Imperium have been met with massive resistance in their invasion so far. The collected northern forces have destroyed several Imperial space stations, deployed with the intent of being forward staging bases, and devastated Imperial fleets with an overwhelming fleet of super-capital space vessels. At the same time Imperium forces and their allies have taken multiple resource generating moons, in line with their stated strategic goals at the onset of the war. This war promises to last at least a few more weeks, and it’s not completely out of the question to see it last well into the coming months. Both sides in this war have groups which focus on accepting new players and getting them engaged with the game. So if anyone is on the fence about playing EVE in a serious way, war time is the best time to get involved.